The JL303 is our powerful 3-pocket fitness sorter that will greatly reduce your workload. Being fully compliant with ECB-regulations, it is formidable addition to Julong’s innovative product range. The machine can be used near the register as a reliable aid to the cashiers or in a back-office environment to greatly speed up the daily routine and enable precise bookkeeping. The JL303 is all about efficiency. Whereas 2-pocket machines need two runs to complete the fitness sorting process into the three categories Fit, Unfit, and Reject, the JL303 o nly needs one. This will immensely increase the efficiency of your sorting process. The JL303 is thus equipped with numerous processing modes. 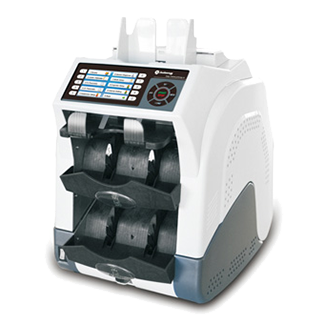 Apart from value counting, where the total monetary value is determined, and piece counting, used to count vouchers for example, the JL303 is also able to sort banknotes according to fitness criteria. The three preset fitness modes represent different sensitivities and follow ECB regulations. The machin e can also sort banknotes according to their orientation, creating a uniform appearance when stacking ATMs or handing out money to customers. The detection module within the JL303 contains three CIS image detectors and one light source. The entire surface area is photographed and scanned on both sides of the banknote, ensuring that any irregularities are detected. The abundance of sensors raises the security of the cash handling process to the highest level, unmatched by competing machines. The JL303 is the only machine of its size whose sensors will detect tape on the note’s entire surface area. Light of differing wave-legths, ranging from ultraviolet to infrared is scanning every note. Information such as value, geometrical data, thickness, and security features is analyzed and checked by the internal micro processor. Magnetic features are checked on the banknote’s entire surface area and a unique procedure decodes the security thread. The JL303 examines banknotes with a level of precision that was in the past only achievable by large back-office sorters. The user-friendly touchscreen displays the data in a comprehensive and clear manner and will, thorugh advanced self-diagnosis, keep the user informed on the machine’s status. By following the instructions on screen, unlikely events such as jams or malfunctions can be alleviated easily. Our portfolio of 12 currencies, spanning around the globe, is continuously expanded upon. Our machines have been processing, among others, Canadian Dollars, Israeli Shekels, and Hong Kong Dollars for many years and have always yielded grea results. Julong machines are able to handle the aformentioned currencies with their polymer features without problems. The machine’s cutting-edge ES2-platform ensures that you are able to process future ES2-banknotes, and lets you be prepared for anything the banknotes from the ECB’s Europe series, have to offer.